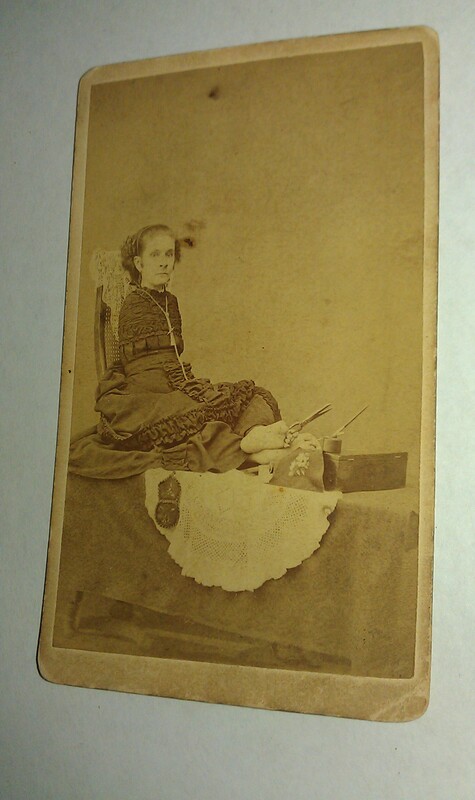 1876 Georgia Ann Leak Armless Seamstress Scissors Between Toes Unusual Photo CDV CDV photo mount measures 2 1/2 X 4 1/8 inches. SOME INFO FOUND ABOUT Ann E. Leak. ---Ann E. Leak the armless wonder. Anns home town Griffin, Georgia the Southern Herald published a detailed account of what to expect during her show. she crochets, braids hair, embroiders, writes, sews, and uses scissors, knife, fork, tumbler, etc., with as much ease and comfort as though blessed with hands, Other similar promotions in print mention demonstrations of knitting along with crochet. 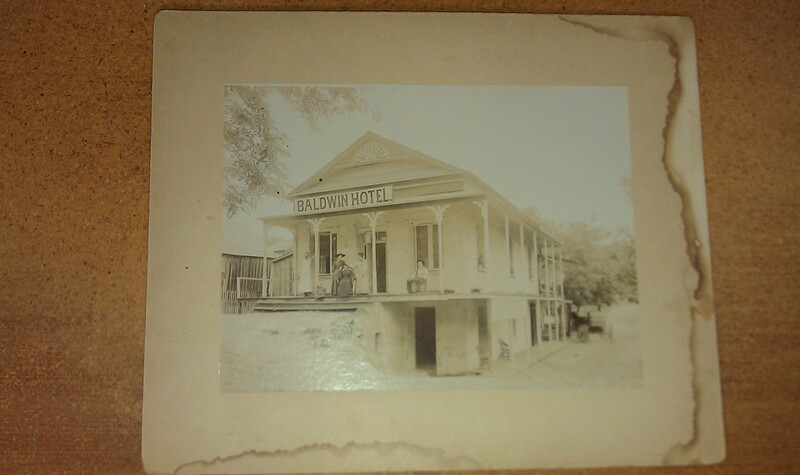 1900s Mokelumne Hill Calaveras Louis Baldwin Hotel West Centre Street 9X11 Phoo Original Vintage Mokelumne Hill Calavteras California Baldwin Hotel mount photo,stains at lower and right of mount,measures 9 X 11 inches. Very nice image, building stands today as a private residence.------Some Info------- Owner Charles Gardella,lower basement latter had a Undertaking parlor downstairs and the living up stair. In 1909, Charles Gardella wife, Lenora divorced Gardella and took the younger children with her. She remarried, but their older sons stayed near their father. John Gardella (1888-1956), Charles son, eventually opened the Gardella Mortuary in the downstairs portion of the house in the basement. He was the County Coroner and a mortician for over 48 years. 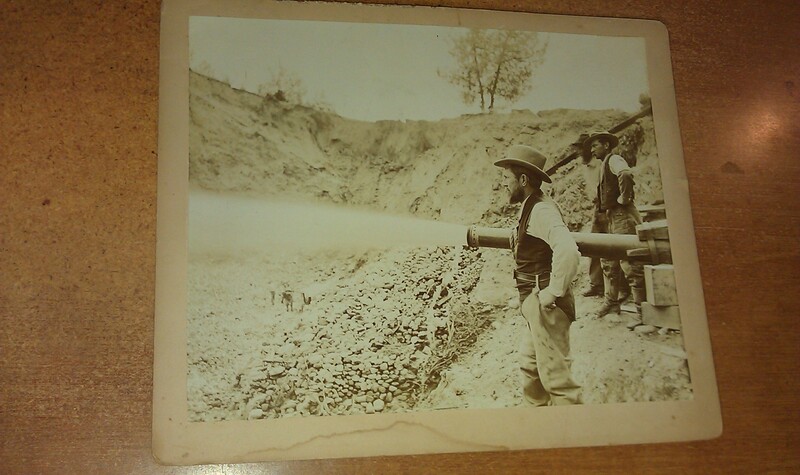 San Andreas Mokelumne Hill Hydraulic Mining Old Woman Gulch Calaveras CA 9X11 Mt Photo 2 Photos Calaveras County California Hydralic mining and mine,Man standing near entrance of mine leaning with his rifle, Men at Monitor. Mounts measure 9 X 11 inches. 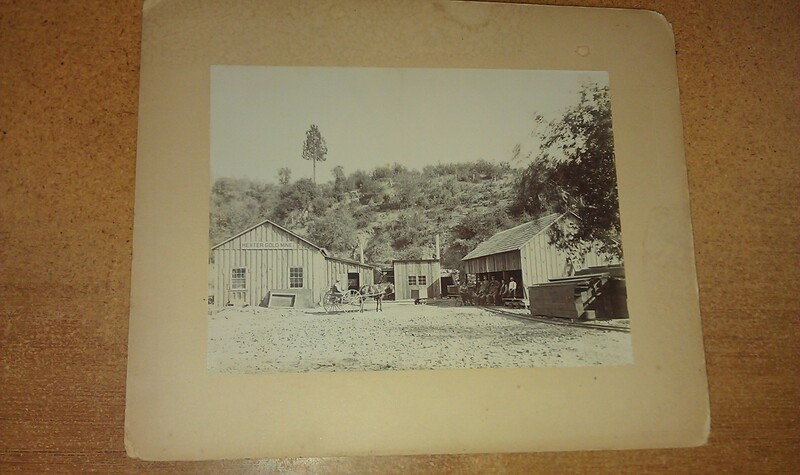 1900s Mokelumne Hill Calaveras Hexter Gold Mine Ore Car Miners 2 Photo 9X11 Two Original Vintage Mokelumne Hill Calaveras Mining District Mine California, Gold Mine mount photo,stains at lower at edges of mounts,measures 9 X 11 inches. Very nice images. Miners holding cats, dog,mining ore carts on rails at entrance of mine.......SOME INFO...Comment, GEOL.DESC. PROPERTY WORKED FOR GOLD IN THE GRAVELS AND FOR THE OPALS FOUND ON THE PROPERTY, HOWEVER, OPALS ARE TOO SOFT AND ARE NOT USED AS GEM STONES. PAY GRAVEL 150 ft WIDE AND 7 ft DEEP, SLIGHTLY CEMENTED. 2000 foot TUNNEL DRIVEN IN THE DIORITE BEDROCK UNDERNEATH THE RHYOLITIC AND ANDESITIC CAPPING TO THE CHANNEL, THAT FORMS THE CREST OF STOCKTON RIDGE. THE CHANNEL WAS DRIFTED ON FOR A DISTANCE OF 500 foot North AND 500 foot South. 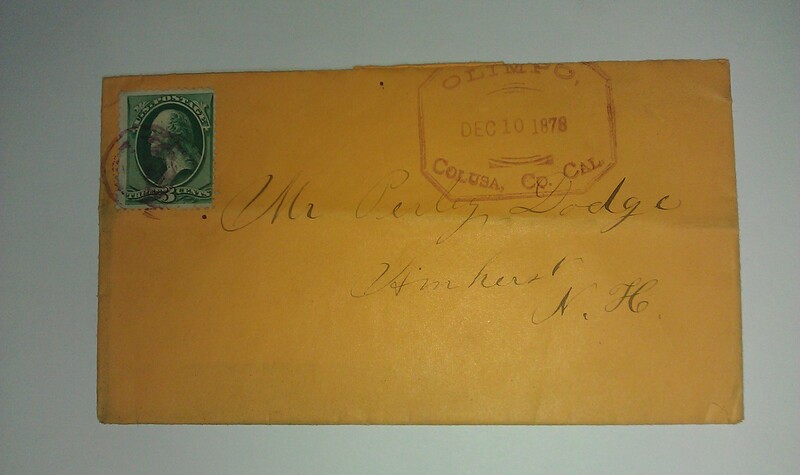 1878 Olimpo Colusa California Non-Standard Rare DPO Cover to Amherst NH Years of post office operations Dec 31 1872- March 22 1883. Williams cancel type COL-1360. 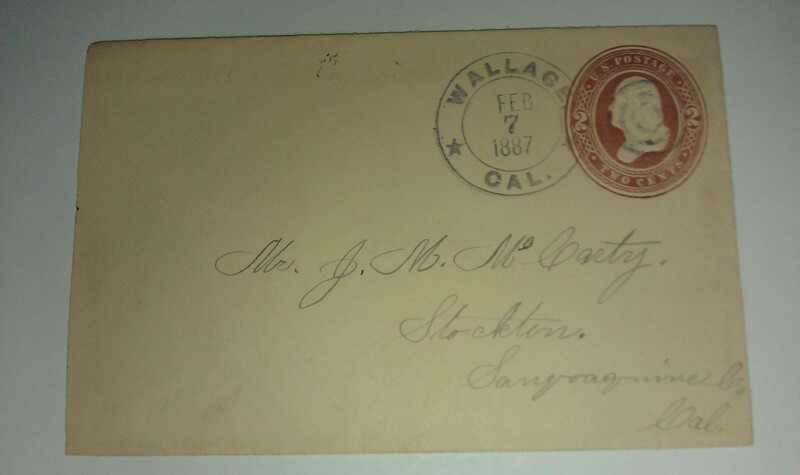 This cover new date of Dec. 10 1878,over 3 months latter than recorded. Name derived from Spanish phonetic version of a Miwok Indian word. A Tribal name. Site became a part of Glenn county March 11 1891. located 6 miles, northwest of Orland. Cover has crease at center. 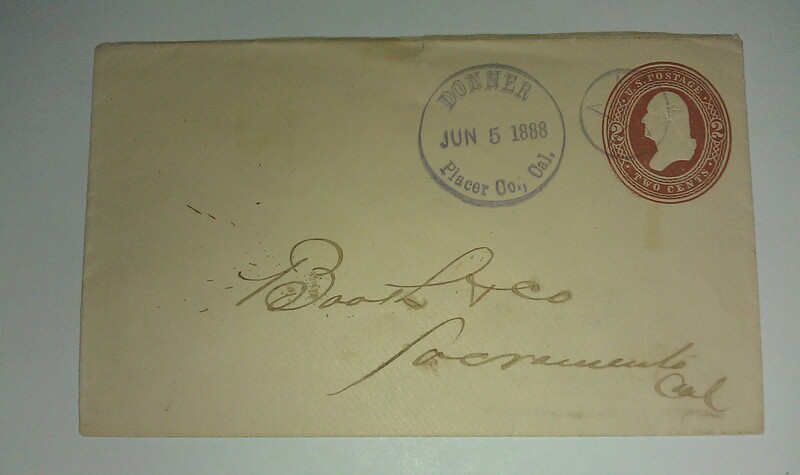 1888 Donner Placer County California Star In Circle Cancel Cover Sacramento Cover good condition. Williams cancel type PLA-1270. 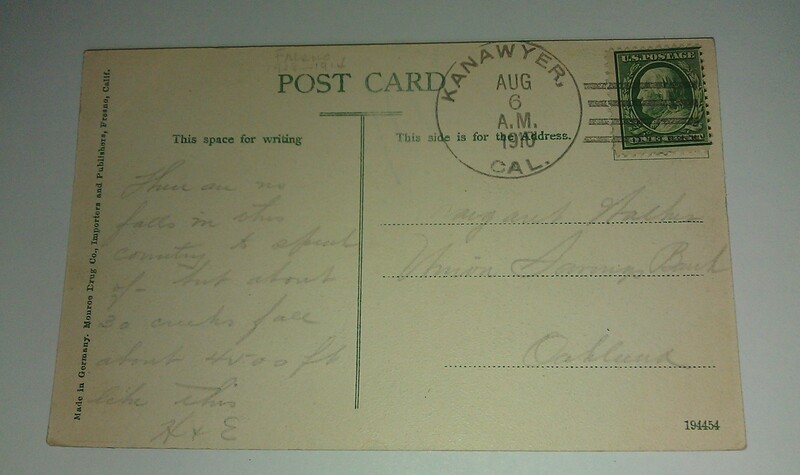 1910 Kanawyer Fresno California Grant Creek Falls Canyon Post Card Dead Post Office Years of post office operations opened Nov. 18 1908 ,closed March 15 1914. Post Office moved to Hume. Town named for Napoleon Kanawyer,a pioneer settler on nearby Copper Creek. 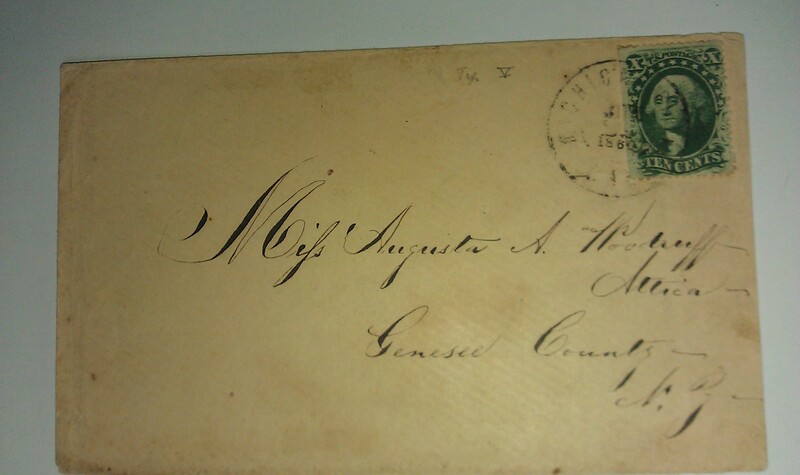 1861 Michigan Bluff California 10 Cent Overland Rate to New York Cover Spotty cancel June 30 1860 Year date cover to New York. Cover reduced at right edge. Williams cancel type PLA-2470, earlier use than recorded by more than one year.